My specially ordered shirt to wear to our first Pediatric Cardiologist visit in November. I was speaking His word over our appointment. First, let me start by saying how much each of mean to me. Your continued support has, at this point, lasted a bit over a year. Some of you are family. Some of you are personal friends who I’ve known for years. Some of you are “virtual” friends. Some of you are followers who love Everly. Second, let me also tell you that, though I did not think things could get any harder, they did. Third, I've thought long and hard about this message I'm sending you and have had it in the queue awaiting publishing since the weekend. I've also spoken with my husband, he has read this and he is fine with this going out. I have shared all parts of this journey with you and this is an important part. A big part. I need to make a quick timeline to help refresh your memory of this last year to better understand the latest news. August 2013. Had Maternity 21 screening which looks for Trisomy 13, 18, and 21. Less than 1 percent risk out of 10,000. No concerns. October 2013. 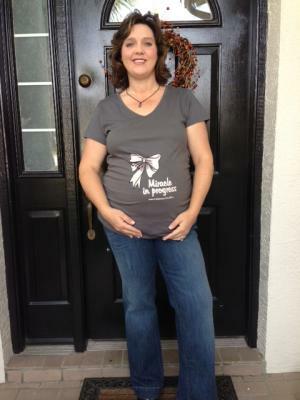 Atour 20 week ultrasound, choroid plexus cysts were found on her brain. Referred to high risk clinic. October 2013. High risk OB sees hole in her heart and tells us that she suspects something called Trisomy 18 which we had never heard of before. She tells us that it is a fatal genetic condition. I refuse an amino to confirm the suspicion. They refer us to a fetal cardiologist. November 2013. 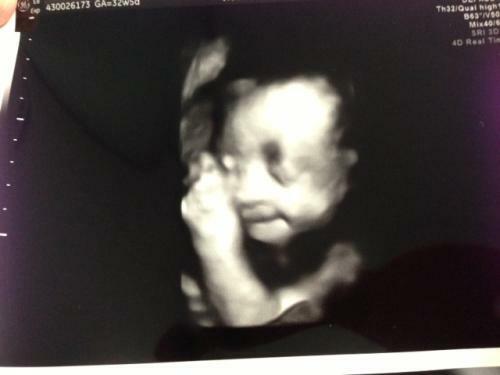 At fetal cardiologist's office, he isunable to see any problems or concerns with Everly’s heart or development. He gives the all clear but asks us to come back in a month. We rejoice and celebrate this incredible miracle! Dismisses the suspicion of Trisomy 18. December 2013 Return visit to fetal cardio’s office and this time he finds a large hole in her heart (VSD). Suspects Double Outlet Right Ventricle. We are shocked but thankful this is repairable and not fatal. Still no additional concern of any genetic anomalies. January 2014 Return visit to fetal cardio’s office and this time he tells us that he also suspects coarctation of the aorta in addition to the other congenital heart defects. Weare crushed but still again feeling glad that it is repairable and not fatal. Still no concern of any genetic anomalies. October 2013 – February 2014 Continue to also be seen by OB doctors twice weekly, one visit for biophysical (ultrasound) and one for non-stress test. No mention or concern still at this point of genetic anomalies, even though my mom and I had done research and knew to ask about clenched hands as markers. At birth, there was suspicion of some chromosomal abnormality and a FISH test was ordered. Results came back on 2/25 that she was Full Trisomy 18. Fast forward to October 6, 2014. We went in to the geneticist for the first time since birth so we could help them to see the “other” side of Trisomy18. While there, we found out that her original test at birth stated that she was borderline Full Trisomy. Basically what that means is that she was close to being considered Mosaic Trisomy 18, which has a much longer and better-fairing prognosis. Mosaicism occurs when the extra 18th chromosome is only found on some cells inthe body, not in all like in Full Trisomy. Many children with Mosaicism can walk, sit up, feed themselves, eat bymouth and SO much more. But the biggest thing is their life expectancy is much, much longer and can be into the 30’sand 40’s. In addition, the medical community typically offers those children surgical interventions like heart repairs which drastically improves their quality of life as well as their lifespan. Jimmy and I at the baby event days after her "clear heart" report in early November. In hearing her borderline status, which was news to us, we requested her to be retested and so she was. I didn’t think too much about it honestly because at birth they said it was close enough to be considered full (though they hadn’t told us this information). About two weeks later, I received a phone call from the counselor that stated Everly’s test came back that she was indeed MOSAIC Trisomy 18!!!! I was in shock and utterly speechless. We decided to schedule an appointment with the geneticist to get more details and more about what this diagnosis this means from a genetics standpoint before sharing with everyone. In the meantime, I was on cloud nine knowing how this would change her life and ours drastically! I would not lose my daughter so soon, she could live life with us. I felt the blessing of God and that He had answered our prayers from so long ago. Though she wouldn’t be whole, she would be here for a much longer time! What a cause to celebrate! In the meantime, we decided right away that we needed to get her G tube surgery with this new info. So we met with GI who then ordered the Upper GI which found her malrotation of the stomach. We also told our cardio at our appointment last Monday (November 3) and she was completely caught off guard by the new diagnosis. She then said she would need to think about it but given the new prognosis, heart repair or banding could possibly be a consideration!!! I was jubilant! Her first smile at about 33 weeks. That follow up appointment with the geneticist was also last Monday (November3) in the afternoon. My intent for going was to try to get some information about Mosaicism. However, my husband had a doubt about the validity of this new test because Everly had mouthcare (breastmilk) about two hours before. The test was a cheek swab. He was concerned the test picked up some of my DNA instead tainting the test. So, he requested that this test be redone. They redid the test then—she had mouthcare again with breastmilk about 5 hours prior this time as I was not anticipating having her retested. Results were due in on Friday, November 7. As you can surmise, I was devasted, distraught being a better word, at the thought of retesting. However, I had faith that God would show up in this new test as well. I knew my husband, coming from an atheist viewpoint, could not just believe that the result was what God had wanted. He needed to question it. I also knew that that I was to honor my husband and this included going through with the retesting. 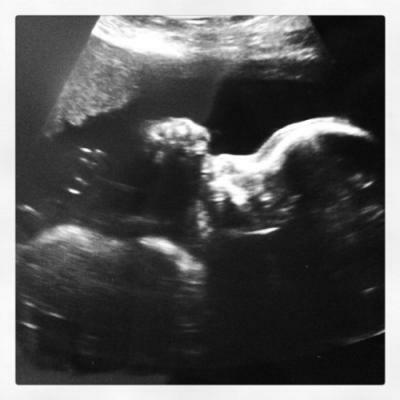 Baby Everly at 20 weeks. Love this one. Last week was almost unbearable. I finally had a breakdown last Tuesday. It all came crashing down at once and it was just too much. The days couldn’t pass quick enough. My heart was racing, my prayers more determined. On top of the waiting, his sister and his brother-in-law came into town on Thursday so I needed to put on a happy face. Though I was looking forward to their visit, I just was having a hard time coping with it all. The year seemed to come to ahead this exact week. I knew when the caller-ID said “Caller Blocked” who itwas. I also knew the minute she spokethe first word what the news would be. I can’t quite remember what she said but I do recall hearing “this rollercoaster” and “Full Trisomy” somewhere in the call. It was like February 25 all over again. The same darkness reappeared. The same abyss. I couldn’t speak. And I couldn’t understand it in my human, earthly existence. Why, God? It didn’t make any sense to me at all. Jimmy was beside me and I had the phone on speaker and I just handed him the receiver and walked away. My baby, who just got a second lease on life, would not be with me like promised just four short weeks ago. I just did not understand. This “roller coaster” the counselor spoke of was a ride that I didn’t seem to be able to stop, let alone get off of at all. It’s like the cruelest of jokes. From way back last year with our first Maternity 21 test all the way to that moment. It was all a cruel joke. 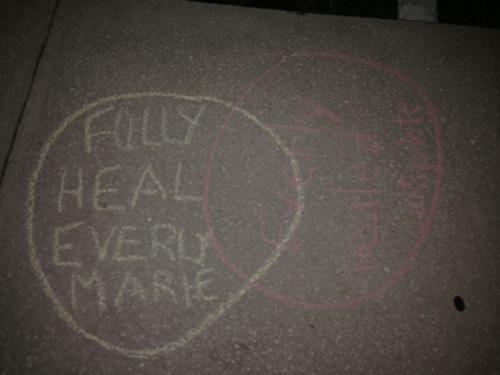 Our first of many circles for Everly outside our church. My daughter was offered this same repair not days before…what was so different about her now? She still has malrotation of her intestines and complications of which could turn into an emergency at some point just as cautioned us at the appointment. Forget about repairing it and heart repair…ha! Now, of course, I'm not going to just leave these issues like this and I have messages waiting to be returned and doctors to now visit, but I want you to know what it is like to have a child considered "not worthy" (my words, yes) of an operation, a repair, an intervention that would be offered to ANY other child without Trisomy 18. I now have to fight. I’m defeated. I’m not going to lie. I pray this feeling is temporary and that I will just pick myself right back up, dust myself off and get moving. I’m really starting to get Job and how he must have felt to some small extent. Setback after setback and still you must move. In the face of severe adversity,you must seek God because without Him, there is no hope. I know all of this in my head, but my heart is in about a million pieces again. It all boils down to the fact that I will still praise Him while this storm rages. I know the blessings that He has provided and that He will continue to provide. I know that I will continue to ask for healing in her body and that I would ask for intercessory prayer for her. I have my arms around my little miracle whoI’ve been immeasurably blessed to hold for going on 9 months. I can’t discount the hugeness of this fact alone. We are SO blessed that she is still with us this many months later. I have two boys who believe in the power of our God and who in the face of what our family endures daily still hold Him in reverence. Our family has an amazing support system surrounding us that has kept us fed, uplifted and overall just wrapped in love. For that, we are blessed beyond measure. I know in my broken and hurting heart that we will overcome this hurdle (though that word seems so insignificant in light of theenormity of this situation) but it’s going to take some time. This year has taken its toll and this pastweek was most certainly a pivotal point for me. Your prayers, messages, texts, calls and emails are so treasured by me and I thank you for those over the past year. This whole “prolonged grief” combined with the incredible joy of being Everly’s mom mixed together is an emotional and sometimes difficult journey. I know it’s been hard with lots of twists and turns. I know that it still continues. I thank you for going alongside us. This past Monday, Everly wasn't acting herself and was quite congested in her throat and chest. After hearing that she'd had a rough night, Nana convinced me to take her in to see Dr. Graham, her pediatrician. So we did. Everly was found to have just a slight possibly viral infection that we hoped would run its course. No antibiotics yet just keep a close eye and let her rest. She seemed to perk up on Tuesday and Wednesday and then Wednesday night have a miserable time trying to rest. She whimpered and was hoarse most of the evening and couldn't get comfortable no matter where I placed her. So put a call in to the doctor Thursday morning. Dr. Graham advised us to head back in at 4:45 if she didn't improve throughout the day. Indeed, she did not. We spent the day cradling Everly and trying to make her as comfortable as we could. However, she continuously coughed and sneezed all day which would cause her some considerable discomfort. We ran a humidifier wherever she was and gave her nothing but rest. The most alarming thing for me was the color change I witnessed throughout the day. Her fingertips and forehead were bluish/dusky...a color you do NOT want to see on your child. EVER. I felt that she definitely was lacking oxygen, probably because she was working so hard, and put her back on the pulse ox machine to get a read. My instincts and vision were correct because she was Sating in the mid 70s. Not good. Flipped on the O2 and gave her some blow by air. Her numbers really never rose past 85 when normally they range 94-96 with no air. Once in the office, Dr. Graham quickly found that Everly had the crackly gunk in her right lung indicative of pneumonia. Ugh. Not what we expected to hear at all. Thought things had gotten worse but not that bad. She decided that an injection there of Rocephin would be best and then also one the next day. It was a considerably thick medicine so it stung going in Everly's leg. She also would need continuous O2 while she fights off the yuck that was trying to bring her down. We pray for a quiet night for her with much rest and peaceful sleep so she can have the energy to fight this. Praying for her doctors to make wise choices concerning her care and treatment. Praying for the pneumonia to clear up without any further incident. We pray that we will not have to take her to the ER or the hospital that she can handle this fight here at the house safe from more stuff aiming for her. We thank you and would appreciate you joining us in prayer. 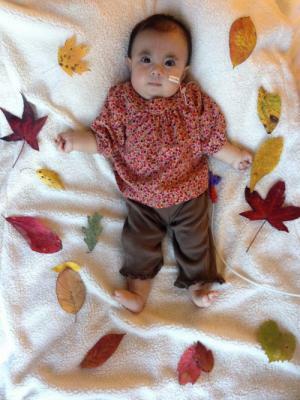 From the moment we were told the devastating news of Everly's diagnosis of Trisomy 18, we knew we wanted her to experience "life." Our goal from that very day was to get her out of the confines of the hospital and home with her family. While we waited for all the necessary requirements before being able to leave, we began to think about all that we would not get to do with her. The thoughts were overwhelming. Debilitating. Depressing. As the days went by, however, our mindset changed to suddenly what things we wanted her to experience and not what she could not do. We knew we could give her a taste of our life...the one she was born into and we wanted her to experience as much of it as we could. Everly's Bucket List was born. See, we have been lovers of the "bucket list" for a long time now. For us, it's something to look forward to, work towards, embrace with joy and aspire to complete. It is not nor has ever been synonymous with death or anything of the like. We had a bucket list, and still do, for our marriage. For example, we'd like to hike the Grand Canyon together. We have a bucket list for what we would like the boys to experience or be taught before they leave home. We have a family bucket list of experiences we would like to complete together, like getting scuba certified. So, while we may be loosening the constraints of the title, bucket list, we have used and loved them for years. Several years ago we found tiny silver Dollar Store buckets that we have put slips of paper filled with the list items that we use to actually symbolize the proverbial bucket. Now, I know what some of you about right now are thinking...how can a newborn or infant have a bucket list? Am I right? Well, it's simply like this: part of Everly's Bucket List is the experience she would have doing various activities, like feeling the sunshine on her face or hearing the sound of the waves. But other parts of her list, like being in the midst of her brother's nerf fight or hiking on the AT, is important to us because it's a important to someone in our family. And in those cases, we get joy from having those moments with her. At the end of the day, this Bucket List is about creating memories of our life with Everly. It's joyful. It's life-affirming. It's anything but sad. When we left the hospital we had a very short list, maybe 6 things. One at a time, we checked them off the list. Feel the sunshine. Check. Go for a walk. Check. Until those things were all completed. We added a few more things. As it was now Easter, we added some new Bucket List items like get an Easter basket and go to church. Check and check. And so it continues to go. We discuss as a family what will be placed on her list and then we proceed with checking them off. I still remember the giddiness I had late summer when I realized I was actually thinking about her Halloween costume, then Thanksgiving and unbelievably, Christmas! So, more list items were added for each of those holidays and seasons. I never thought in a million years based on what the doctors predicted (congestive heart failure at 2-3 months with no option of a heart repair due to her diagnosis) that I would be looking ahead to these holidays! So, Everly's Bucket List continues to evolve. And for that we are grateful. Go to Disney World and be where everything is wonderful! Have a meal with the princesses at Cinderella’s Royal Table at Disney (Very cliché but Disney IS the happiest place on earth. Bundled up for the cold. Heading out to hike but was completey snug in Mommy's Moby wrap. I love this quote by Joyce Meyers because it has my name all over it. I am a proud, card-carrying member of this club. I love, thrive and enjoy things--all things--laid out all nice and neat. Predictable, you could say.Needless to say, my life as of late is as far from organized as one could probably be. But you know what? God is MORE present now in my disorganized, jumbled up life than ever before! I see Him working in ways that I most surely would have missed before when everything was "just so." Let me tell you about our weekend. On a bit of a whim, we decided to take a whirlwind trip this weekend to Atlanta to check "seeing fall colors" off of Everly's Bucket List. We planned to cram a lot into a short amount of time. God really showed His goodness and grace while we were there, let me tell you! I'm so glad He's been--er, shall I say, helping me over the last 8 months--to be less organized and more ready for a moment when it happens. Starting with our hike. It just so happens that our ranger, Don, who took us on a guided hike was a God-fearing man who appreciates our beliefs and faith. He understood our purpose for coming and made the experience top notch, telling us all the fascinating details of the history of this Civil War park that homeschoolers just devour. Don taught us about the many varieties of trees on property and showed us how to identify leaves, nuts and vines. We learned so much and were thankful to be able to share our praise with what the Lord has been doing in Everly's life with him at the same time. Cool fact: Scenes from the new Hunger Games movie (Mockingjay) were filmed here. Didn't know that before we arrived. A HUGE shout out and THANK YOU to park ranger Kelly at Sweetwater Creek State Park in Lithia Springs, GA for making our tour with Don a reality! In the true fashion of a homeschool family on a vacation, even a mini one, we made the most of the short time we had and went to the World of Coca-Cola for what we were hoping would be a great lesson in business. What. An. Experience. For real. The lessons learned in this one visit reached far beyond the pages of a school text. While we wanted to take the boys on this tour, it was still an indoor activity in the midst of cold and flu season. Our plan was to take them on a small tour so that we could bypass as much of the crowd as we could, thus keeping Everly as safe as we could. Because God is watching out for His children, He provided in a way that only He could have. The entire Coca-Cola staff must have "known" about Everly because we were given star treatment, including a stellar tour guide, Steve, to weave us in and out of crowds, bypassing nearly everyone who could have breathed on her. Staff members would randomly stop and say hello and ask how Everly was, using her name, as if we were old family friends. We felt so welcomed and safe there. 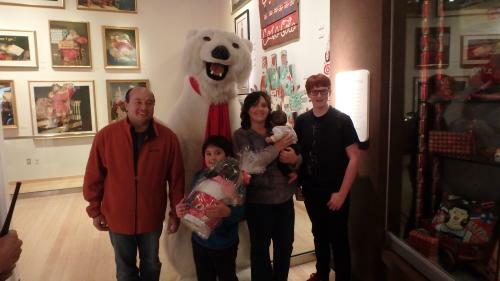 Then towards the end of our tour, the Coca-Cola bear and some of his buddies found us at a display with Steve and came bearing (yes, pun intended!) a gift for the family. The boys loved the tour as much if not more than we did, not only because of all the cool stuff there, including a plant line AND a tasting room with 100 different Coca-Cola products, but because for one three hour period, one afternoon, one part of a day, we just were a family of five touring an attraction. Thanks Steve and the Coca-Cola family for giving our family a day of memories and a wonderful visit! God moments just appeared in SO many ways for us on this trip! I'm so thankful and grateful to him for giving me the EYES I needed to SEE what He wanted us to experience. 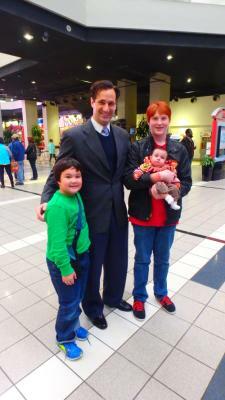 THE Carl Azuz and for us, a true treat to meet! As we made our way back to Tampa on this quick trip, we decided to swing by quickly to see the CNN Center where our favorite show of 6 years is filmed, CNN Student News. As we entered the atrium area, we found a spot to wait while Jimmy ran back out to the van to grab something. I happened to glance to my left and I see Carl Azuz, the Student News anchor, writer and pun-writer extraordinaire, walking by. My knee jerk reaction was to call out his name and at that, he turned, smiled and walked over to our table. He chatted with us for a good bit, took a few photos with the boys and graciously ignored my over-exuberant excitement at meeting him! What a treat it was for us just by "happenstance" (insert God's doing here) that the ONE person we hoped to see walked right by us! And, please, let me tell you that he was so incredibly amenable to visiting with us, answering questions and was not in any apparent hurry to move along. Carl Azuz...what a way to end our trip! Thank you! See, while some may consider all this "good luck" or something of the sort, I know that God knew just what our family needed right then. We had just gotten the news about the malrotation of Everly's stomach and a 5 day minimum hospital stay to have surgery for it and the g tube. Of course, this was quite emotional to think about. Cue music. Just like God did for us one year prior, a quick trip to completely take our minds off the fresh news was in the works. 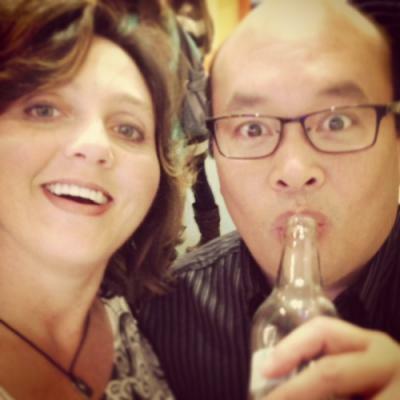 He threw in all sorts of little God winks (the faithful ranger, the special treatment at Coca-Cola, and the surprise sighting of Carl Azuz) to top it all off! You have to understand that we've had emotional highs and lows for the past year so these moments like the trip, big ones like Go Shout Love this month and the everyday ones that come in the form of texts, calls and prayers ARE what helps our family keep putting one foot in front of the other. 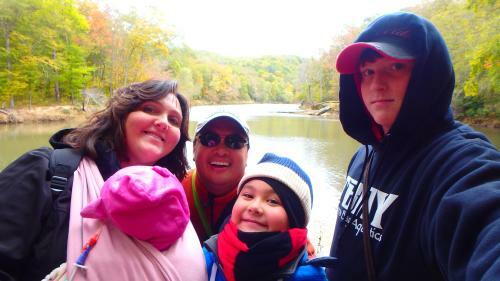 Hiking by the river on a crisp fall morning. May God continue to bless Everly and our family and those who love her. That we will continue to have experiences such as those from this past weekend. Traveling and doing "typical" vacation activities as a family of five is not lost on us. We are grateful for the opportunity and will continue to work to make those things happen as long as we are able.